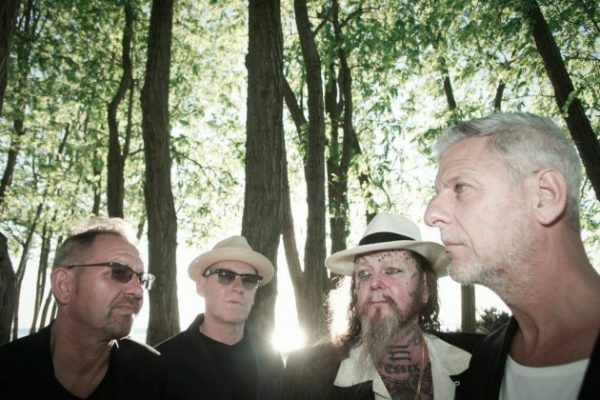 MODERN ENGLISH SHARE NEW SINGLE! Essex post-punks MODERN ENGLISH have unveiled a first single from their forthcoming new album, as well as announcing a London show. ‘You’re Corrupt’ is the first track to be revealed from Take Me To The Trees, their first album to feature (most of) their original line-up of Robbie Grey, Gary McDowell, Mick Conroy and Stephen Walker years. The album was recorded at Asylum Studios on the former Bentwaters airbase in Suffolk with producer Martyn Young of COLOURBOX. Since then, the band has been on tour in the U.S. celebrating their classic 1981 debut album Mesh & Lace. Funded through PledgeMusic Take Me To The Trees is set for release on 24 February and is available to pre-order here. They’ve also announced a show at the 100 Club, London on Wednesday 8 March. Tickets are available here. Formed in Colchester in 1979, Modern English signed to 4AD before finding significant success in the States, alongside the likes of SIMPLE MINDS, GANG OF FOUR and PSYCHEDELIC FURS, thanks in part the the advent of MTV. Their song ‘I Melt With You’ has since become a staple of film soundtracks, TV ads and cover versions and, like ‘Pretty In Pink’ even had a film named after it. Having originally split in 1987 and reformed with various line-up in the intervening years, this formation has been active since 2010. ‹ WHERE THE NIGHTINGALES SING!